This game had to be moved to Valentia after the Renard pitch was declared unplayable. Renard opened the scoring with a point from Conor O'Leary after3mins . Thomas Kennelly got Ballydonoghue off the mark shortly afterwards. Renard were handling the adverse conditions better at this early stage, Shane O'Sullivan was winning good ball at centrefield and Liam O'Sullivan was making good runs at the Ballydonoghue defence. But it was Renards attacking centre back Dermot O'Sullivan that put them 2pts ahead after 7mins after Conor O'Leary had scored his second point a few minutes early. Ballydonoghue began to settle into the game and two points from Paul Kennelly had the sides level after 15mins. Ballydonoghue then had two great goal chances but two fine saves from Renard keeper Alan Egan kept Renard in the game. Ballydonoghue did stretch their lead to 2pts with two Paul Kennelly frees before half time. H/T Renard (0-3) Ballydonoghue (0-5). Early in the second half Renard were awarded a very dubious free when the Renard player appeared to charge head first into a Ballydonoghue player but the referee deemed otherwise and Liam O'Sullivan stepped up to make it a 1pt game. Paul Kennelly restored Ballydonoghue's 2pt advantage after 5mins. Ballydonoghue were having the better of exchanges at this stage but as the game edged towards the 20mins mark Renard were awarded what looked like the softest of frees but to everyone's (including Renard's) amazement the referee then signalled to the penalty spot. Renard took full advantage of their good fortune and dully dispatched the ball to the net. Renard (1-4) Ballydonoghue (0-5). Ballydonoghue incensed by what they deemed an injustice reacted quickly and almost from the kickout Jim Cremins raced through the Renard defence and his shot dipped under the crossbar to hand them back the lead, the referee further infuriated Ballydonoghue shortly afterwards when he dispatched one of their players for a second yellow card offence, both sides then exchanged points before Ballydonoghue squandered a couple of good scoring chances that should have put the game beyond Renard's reach but as the game entered the final minute a Renard effort for a point dropped short and as the goalie came to gather the ball, in the mist of back and forwards the ball was broken down and tapped to the net by a Renard forward to give them a 2pt lead as time ran out for Ballydonoghue. Renard (2-5) Ballydonoghue (1-6). Ballydonoghue: Shane Thornton, Padraig Enright, John Enright, Stephen Lonergan, Diarmuid Behan, Darren Gogerty, Patrick Kennelly, Barry Shanahan, Martin O'Mahony, Billy Joy, Jim Cremin (0-2), Thomas Kennelly, Robert McGregor, Eddie Sheehy, Paul Kennelly. Subs: Darren O'Connor, Padraig Lyons (played) , Wayne Dowling (played), Sean Lyons, Dean Dowling, Jack Gogerty. Only 2pts separated the sides at the end and Duagh can count themselves fortunate to have come away with the spoils after a great second half fight back by Ballydonoghue and in truth had they taken advantage of the large amount of possession they had in the first half the result may have been different. Ballydonoghue where first of the mark with a point after 3mins and were having the better of the exchanges in the early stages but it took until the 18min before they scored again with a Thomas Kennelly point. Having weather the early Ballydonoghue pressure Duagh got their first score after 20 mins thanks to a Kieran Duffy free and shortly afterwards the same player was on hand to capitalise on a mistake by the Ballydonoghue corner back and strike for the games opening goal. This spurred Duagh on and they were well on top for the remaining 10mins kicking three more points. H/T score Bally/don (0-2) Duagh (1-4). The second half was a real ding dong battle and when Thomas Kennelly goaled from a quickly taken free after 5mins it was tip and tuck right to the finish with Ballydonoghue coming to within one point of Duagh midway through the half and they could have been level shortly afterwards but Thomas Kennelly with a point for the taken went for goal and the ball was cleared down field and Duagh's Nigal O'Connor restored their 2pt lead. A lead they never relinquished right to the finish as points from Chris Breen, Kieran Quirke and Maurice O'Connor where matched by points from Paul and Thomas Kennelly. Final score Ballydonoghue (1-7) Duagh (1-9). 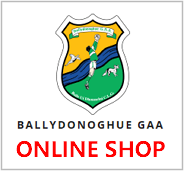 Ballydonoghue: Shane Thornton, Padraig Enright, John Enright, Billy Joy, Diarmuid Behan, Darren Gogarty, Patrick Kennelly, Barry Shanahan, Martin O'Mahony, Eric O'Connor, Jim Cremin (0-2), Thomas Kennelly, Robert McGregor, David O'Connor, Paul Kennelly. Subs: Darren O'Connor, Dan Riordan (played), Eddie Sheehy (played), Wayne Dowling, Sean Lyons, Dean Dowling, Jack Gogarty. Duagh:Jer Kelly, Eoin Kelly, John O'Brien, Diarmuid Foley, Aaron O'Connor, Kieran Quirke, Chris Breen, Peter Sheehan, Maurice O'Connor, Nigel O'Connor, Tim Quirke, Tom Scanlon, Kieran Duffy,Denny Lane, Jason Carmody. Co.Senior League: Kilgaravan (1-2) Ballydonoghue (2-8). Played in appalling conditions with gale force winds, driving rain and a pitch that was just about payable it was all about grinding out a favourable result. Playing into the wind in the first half we still managed to be (1-3) to 1pt ahead after 10mins after good work by Jim Cremin put Paul Kennelly through and he made no mistake for the opening goal other scores came from P.Kennelly 2pts and Dan Riordan (who won some vital possession in the terrible conditions) one point. We were defending tigerlessly into the strong wind starting with our forwards who gave the Kilgarven backs very little time on the ball. But 10 mins before the break Kilgarvan breached our defence when a loose ball around the goalmouth was booted to the net and they followed with another point before half time. H/T Kilgarvan (1-2) Ballydonoghue (1-3). Three points in the first 10mins of the second half two from Paul Kennelly and one from Thomas Kennelly gave us some breathing space, Kilgarvan did threaten for a goal on a few occasions but they were all repelled with Patrick Kennelly making some telling interceptions on more than a few occasions. With less than 10mins remaining points from Jim Cremin and Thomas Kennelly in the space of 2mins looked to have settled the match but if they were any doubt a long ball from Barry Shanahan dropped to David O'Connor and he chipped up to Paul Kennelly and they was never any doubt of the outcome as he struck for his second goal. Final score Kilgarvan (1-2) Ballydonoghue (2-8). Team: Shane Thornton, Padraig Enright, John Enright, Billy Foley, Diarmuid Behan, Darren Gogarty, Patrick Kennelly, Barry Shanahan, Jim Cremins (0-1), David O'Connor, Dan Riordan (0-1), Thomas Kennelly (0-2), Robert McGregor, Billy Joy, Paul Kennelly (2-4,3f). Subs: Darren O'Connor, Eddie Sheehy (played), Sean Lyons. Co. League Div4 Ballydonoghue (0-9) Sneem/Derrynane (0-10). There was nothing between these two sides and the game went right down to the wire with Sneem/Derrynane hanging on at the end to the narrowest of margins. Sneem hit the ground running and had 2pts on the board inside the first minute thanks to their star forward Ronan Hussey who kicked eight points in total. On the other side Paul Kennelly kept Ballydonoghue in touch with two pointed frees. Two more points from Ronan Hussy gave Sneem the advantage as we went into the second quarter. Ballydonoghue then had a golden chance to go ahead, but Thomas Kennelly's lob over the head of Sneem keeper Richard White was brilliantly tipped out for a '45. Both sides then exchanged two points apiece before the break. H/T Bally/don (0-4) S/Derry (0-6). Ballydonoghue drew level 5mins into the second half thanks to two P.Kennelly frees and looked to be in the driving seat at this stage with Barry Shanahan and Martin O'Mahony winning good possession at centerfield Ballydonoghue had Sneem/D on the back foot but they failed to take advantage of several scoring chances during this period one of which was another great goal chance. Instead it was Sneem/Derrynane that took the initiative thanks mainly to some fine attacking play from wing back Sean Cremin and they kicked three points without reply one of which came from the afore mentioned player. Ballydonoghue didn't give up and points from P.Kennelly and Padraig Lyons brought it back to a 1pt game with seven minutes remaining. But with Ballydonoghue looking for the equaliser it was Sneem/Derryane that stretched their lead with another R.Hussey free. Ballydonoghue did pull one point back to leave the minimum between the sides but unfortunately for them time just ran out as the referee brought proceedings to a close. Highlight for Ballydonoghue was 17yr old Jack Gogarty's performance at corner back on his senior debut. Team: Shane Thornton, Billy Foley, John Enright, Jack Gogarty, Darren Gogarty, Diarmuid Behan, Stephen Lonergan, Barry Shanahan, Martin O'Mahony, David O'Connor, Jim Cremin, Dan Riordan, Thomas Kennelly, Eddie Sheehy, Paul Kennelly. Subs: Darren O'Connor, Eric O' Connor (D,Roirdan), Padraig Lyons (S.Sheehy), Sean Lyons, Dean Dowling. Sneem/Derrynane team, Richard White, David MacGillicuddy, Mikey O Neill, David Drummond, John Cremin,Shane McGillicuddy, Michael O Connor, Brendan Teahan , Derek O Shea, Morgan O Donoghue, Denis O Sullivan, Ian Galvin, Ronan Hussey, Donal Galvin, David Breen. Subs used, Raymond White, Kevin O Sullivan, Joe Corridan, Adrian Breen. Co.Senior League Div 5 Ballydonoghue (1-11) Valentia (1-13). We should have had this game well warped up before Valentia goaled 5mins into injury time with the last kick of the game to secure a 2pt victory. That looked most unlikely, 10 mins earlier when they trailed Ballydonoghue by 3pts. Team: Shane Thornton, Billy Foley, John Enright, Jack Gogarty, Darren Gogarty, Diarmuid Behan, Stephen Lonergan, Barry Shanahan, Martin O'Mahony, Darragh O'Shea, Jim Cremin, Dan Riordan, Thomas Kennelly, Padraig Lyons, Paul Kennelly. Co.Junior League Ballydonoghue (0-13) Beale (0-8). Our Juniors had a good win over Beale thanks in no small part to a fine performance from Jim Cremin and a great penalty save by goalkeeper Darren O'Connor after we had just gone 3pts ahead as we approached the final quarter. Team: Darren O'Connor, Timmy Kissane, Darren Gogarty, Dean Dowling, Kevin Cremin, Sean Lyons, Jim Cremin, Wayne Dowling, Kevin Dillon, Padraig Lyons, David O'Connor, Jackie Hegarty, Eddie Sheehy. Ballydonoghue received a walkover from Strand Road. With several players unavailable this was a fine performance and we were right in the game up until the final whistle and had Dan Riordan's shot for goal not cone back off the underside of the crossbar with 3mins remaining the result may have been different. Damien O'Carroll on his first full game in nearly two and a half years after two serious knee operations had a major influence in the game scoring seven of his sides 11pts. Team: Darren O'Connor, Billy Foley, Darren Gogarty, Dean Dowling, Eric O'Connor, Stephen Lonergan, Jack Gogarty, Wayne Dowling, Jim Cremin (0-2), David O'Connor (0-1), Dan Riordan, Billy Joy, Eddie Sheehy, Padraig Lyons (0-1), Damien O'Carroll (0-7-2f). Subs: Kevin Gleeson (played), Gearoid Kissane, Sean Lyons. Team:Dara O'Shea, Billy Foley, Darren Gogarty, Dean Dowling, Diarmuid Behan, Stephen Lonergan, Eric O'Connor, Kevin Gleeson, Martin O'Mahomy, David O'Connor, Jim Cremin, Dan Riordan, Eddie Sheehy, Wayne Dowling, Paul Kennelly. Subs: Shane Thornton, Geriod Kissane (played), Damien O'Carroll (played), Sean Lyons (played), Barry Shanahan. 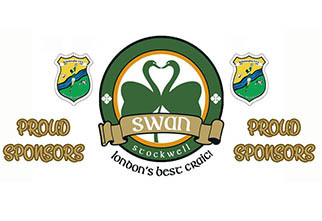 We brought our county league campaign to a close for another year with a win over Asdee on Sat evening. Three first half goals looked to have put us in the driving seat as we approached half time but a goal and a point from Asdee in the 29th and 30th min left the H/T score Ballydon (3-5) Asdee(1-8). A fourth goal 10mins into the second half gave us a clear advantage but in a repetition of the first half Asdee struck for a goal and a point in the final minutes to leave just 3pts separating the sides at the finish. Team: Dara O'Shea, Billy Foley, Darren Gogarty, Dean Dowling, Eric O'Connor, Martin O'Mahony, Diarmuid Behan, Thomas Kennelly, Wayne Dowling, David O'Connor, Barry Shanahan (capt), Jack Gogarty, Eddie Sheehy, Padraig Lyons, Paul Kennelly. Subs: Darren O'Connor Gearoid Kissane (played), John Enright, Stephen Lonergan.